Life insurance agent |The psychology of communicating! Why is it so important for a life insurance agent to understand the psychology of communicating? on their terms and not yours. Why should a life insurance agent want to better their communication skills? Because that is our business. We are teachers. It is our job to explain things to people. if we don't do it clearly and keep it simple, they won't buy. Learning how to communicate with your prospect in the very first opening interview will set the tone. It is a very important aspect of selling insurance. You, as a life insurance agent, must be able to properly communicate with your prospect. Your life insurance selling interview must be communicated in a simple layman's language. That means you must be able to communicate with the person across the table from you, in their language, at their level of understanding. Let me explain! Everybody has different levels of communication. Some people react better to pictures and charts, others to the spoken word. Myself, I like pictures and diagrams. So You Are Both On The Same Page. Through out my selling years as a life insurance agent and insurance recruiter, I learned to rank people on a scale from 0 to 10 as to their knowledge and communication skills. Keeping in mind that I was always an 11. As an example a person with an accounting degree or good business background may be considered a 9. How did I determine that? This was determined during the time that I started to gather information from the client while asking questions in my confidential questionnaire. By asking questions off of my confidential questionnaire , and based on the answers I received, I would rank that persons intellect, and if I decided that this person was a 4 then I am not going to be communicating with this person by using highly technical terms. that would do nothing but confuse them. So based on how that client communicated with me during my preliminary questioning, and listening to their responses, I would then determine how I was going to communicate with that person. If you are not clear on this, feel free to contact me. Another selling concept example and its negative impact. Our local newspaper has an opinions page, called letters to the editor. Sometimes the people that send in these letters to the editor like to use long sophisticated words that are way over my head. I think they are trying to impress the reading public with their intelligence and I am sure they know what they're writing about. However 95% of the people that read that particular article have no clue as to what that person was trying to communicate, because they did not understand many of the sophisticated words that were being used. if they were attempting to sell me on some type of idea, they lost my interest. This is just a way to try and explain my point to you. know-how and knowledge that they recently just learned. They start talking in (insurance jargon) rather than actually communicating with the client properly, by keeping it simple. Remember, you, as a life insurance agent are telling the same story over and over 7 to 10 times a week. You know what you are talking about. however, your prospect is only hearing it for the first time. That is why we must remember first and foremost that famous saying (KISS), which simply stands for... "keep it simple stupid". Many times when I sat in on interviews with new life insurance agents I was training, I would observe that they started to try to impress the prospect with all their new found insurance knowledge, thereby confusing or loosing the prospects attention, and ultimately loosing the sale. 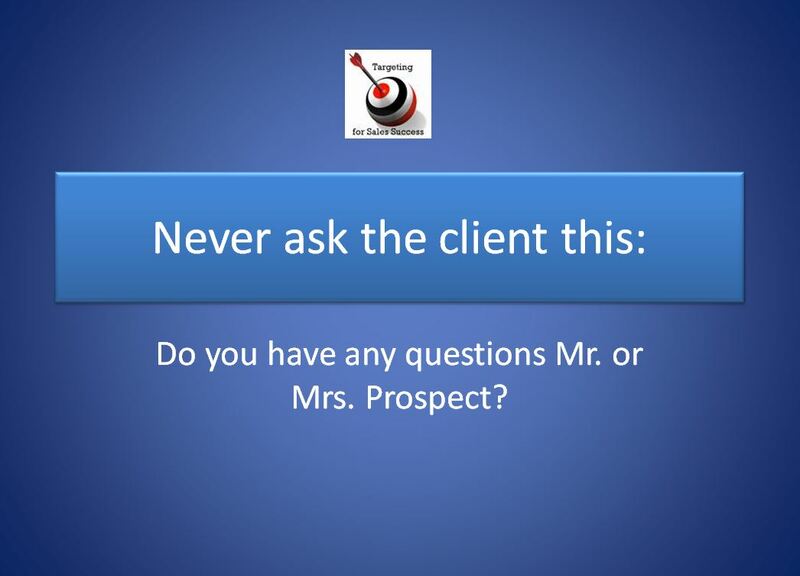 Never ask a client this: Mr. Mrs. prospect. do you have any questions up to this point. Human nature usually will result in a "NO" answer, and that is because people think if they say yes, they may think they are asking a stupid question, and don't want to look stupid in your eyes. in many cases, that unanswered question could make the difference of a sale or not. So when you are communicating with people, you need to observe and watch the prospect and their spouses’ body language and facial expressions during the interview. ” Mr.Prospect Have I made my self clear up to this point. And if he/she indicates any type of confusion I will say : Mr./Mrs. Prospect let me show you what I just said. This is called learning how to listen, by watching and being patient. I would then back up, move to my yellow pad and draw out what I just said by using diagrams, pictures or whatever. I think one of the most important lessons I learned as a life insurance agent, in going through all of the different training schools and working on my CLU, was that I really should use all this knowledge and information to ask the right question at the right time. Asking key questions at the right time is more important than trying to sell all the bells and whistles your company or product provides. Always restate the question. As an example, Mr prospect, if i understand you correctly, you are asking me whether or not this program can have one or more beneficiaries. Is that correct? Why do this? because a person may ask you something and you end up interpreting it the wrong way, and then give the client the wrong answer or an answer to a question he did not even ask. The it makes you look incompetent, and we don't need that, do we? Sales tip: When sales are coming in and your closing ratio is good, you should tape your interview and keep it close by.Why do this? I use to do this with all our agents. New agents and existing agents will have a tendency to add a little something to their interviews on a regular basis and over a period of time, their selling interview and their sales talk is all screwed up. They then wonder why they are not closing sales..
so if your closing ratio takes turn for the worse, Listen to that tape when your closing ratio was good. as a life insurance agent, the psychology of communicating is one of your most important skills to work on and refine.